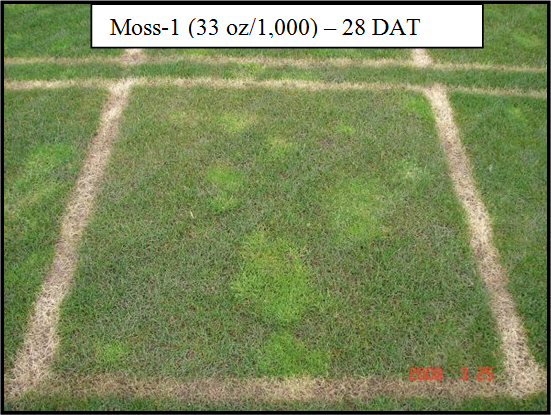 The objective of this trial was to compare two formulations at three rates of citrus oil (d-limonene) with three commercial standards (Worry Free Moss & Algae Control, Garden Safe Moss & Algae Killer, and Lilly Miller Moss-Out) sprayed at 2x label rate to determine perennial ryegrass (Lolium perenne) and annual bluegrass (Poa annua) tolerance to these products. The trial was initiated on February 26th at the Lewis-Brown Horticulture Farm in Corvallis, Oregon. The trial site was a stand of perennial ryegrass that had been planted 4 years ago on a silty clay loam soil with a pH near 6.0. Annual bluegrass had encroached over time. The weather on the date of application was foggy until noon and then the sun broke out and was sunny the rest of the afternoon with light clouds. The products were applied between 3:00 pm and 4:30 pm with the first six treatments being applied in full sun and the last 3 treatments applied in filtered sun. The temperature and relative humidity at 2:45 pm was 50 degrees Fahrenheit and 78%, respectively. All treatments were applied with a CO2-powered plot sprayer with a 5 foot boom using TeeJet 80015 flat fan nozzles spraying 2 gallons per 1,000 square feet. All products were applied at a spray volume of 6 gallons per 1,000 square feet by spraying each plot three times. A metronome was used the time each application. 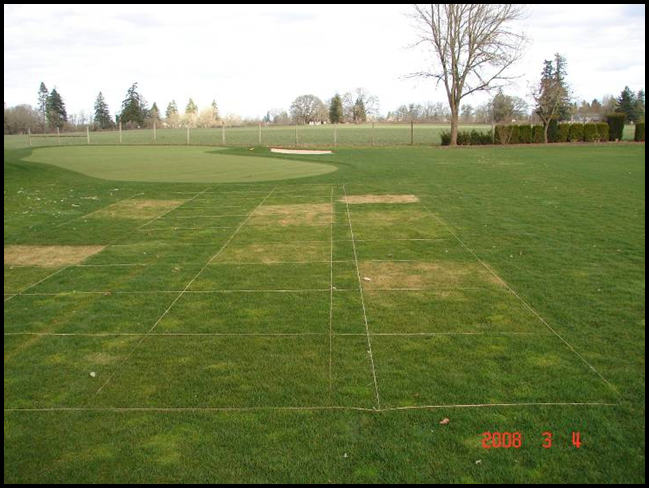 Because of cold temperatures, the plots were first mowed 3 weeks after treatment and then mowed weekly. The plots were mowed at 2 inches with a bagging rotary mower with clippings retained. 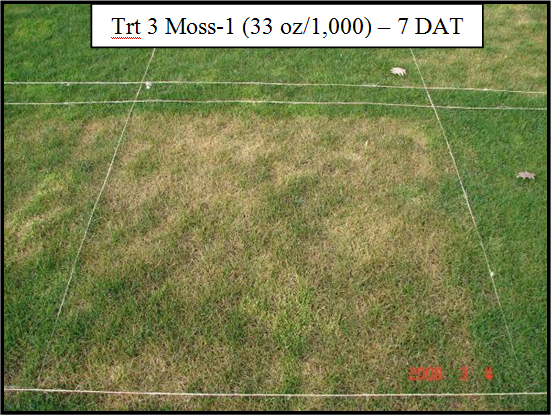 The lack of mowing early in the trial likely prolonged the turf injury as the injured leaf surfaces were not removed. Because of adequate rainfall, the plots were not irrigated during the duration of the trial. The trial was set up as a randomized complete block design with three replications using a plot size of 5 X 5 (25 square feet). Visual turf injury ratings were made on February 29 (3 DAT), March 4 (7 DAT), March 11 (14 DAT), March 25 (4 WAT), and April 18 (7 WAT). The data for each rating date were subjected to analysis of variance (ANOVA) and differences between means were determined by LSD at the 5% level. * The active ingredient in the Worry Free Moss & Algae Control product is 15% sodium lauryl sulfate and 6% citric acid. The active ingredient in Garden Safe is potassium soap of fatty acids. The active ingredient of Moss-Out is ferric sulfate. 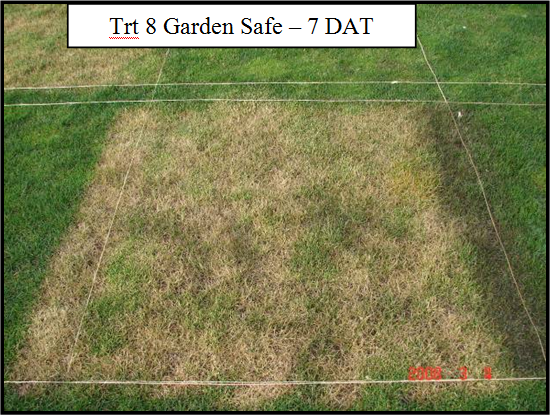 Three treatments (3, 6 & 8) had moderate to severe leaf burn. The remaining seven treatments had no injury or only very slight leaf tip burn. 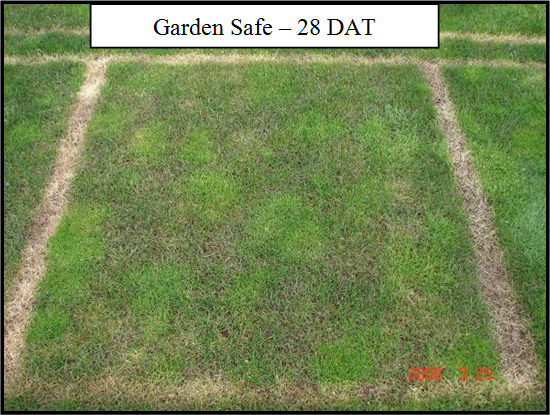 All treatments recovered from injury 28 days after treatment and no turf death occurred (See photos on page 4). As noted above, the lack of mowing early in the trial may have delayed the apparent recovery of the grass as the burned leaf tips were not removed. As you can see from the data shown on page 4, there was a large reduction in turf injury between 2 weeks after treatment and 4 weeks after treatment coinciding with the first mowing which occurred at 3 weeks after treatment. There was no turf injury observable 8 weeks after treatment.